Lowdown: The ageing former star of a superhero movie franchise grapples with a serious Broadway production. I am mature enough to know, by now, that award winning is not necessarily an indicator of quality. It is usually, however, an effective mean for attracting attention; it definitely worked for Birdman. That, and the reappearance of former movie star Michael Keaton in a starring role that has obviously been built around his ex Batman persona. Awards or not, the first thing you will notice with Birdman right from the get go is that it is a bit weird. Or rather eccentric? I mean, how else would you describe a scene of an underwear dressed Keaton meditating in mid air with his back to us? The next thing you will notice is Birdman’s direction and camera work style. The whole movie is designed to look as one long shot, with the camera moving from physical place to another as events unfold. This means very long shots (there are obviously cuts along the way; the movie does not try to deceive its viewers there). It must have been hell to shoot! It also means proceedings take place at a relatively limited area, a Broadway theatre and its surroundings. And it means the camera movements attract attention and, quite quickly, become a rather tedious affair that drives constant and relief-less activity in front of our eyes. Definitely unique, though. Supporting the unique visual style is a unique soundtrack. Most of the time what you will hear will be a solo drum operation. It’s interesting, often nice, and definitely original. Just like the visuals, it gets tedious rather quickly. There is a movie lurking behind the unique visuals and the sound, and yes, it’s the Michael Keaton show. Other than his movie character being the ex Birdman instead of the ex Batman, it’s all about him. His now older self, that is, that focuses on proving to the public there is still something in him by running a serious Broadway production that no one really cares about other than the fact it stars the former Birdman. Mirroring Keaton’s is Edward Norton’s character, the play’s co-star and a Broadway star: he has an affair with Keaton play character’s partner, Naomi Watts, who is actually Edward Norton’s ex real life partner. In real life Norton couldn't get things up and running with her, but in theatre he gets a major hard on (the crowd will attest to that). This struggle between where one is more real, in Birdman or in serious theatre, in one’s real bed or the stage bed, is what Birdman the movie is all about. Specifically, one of the questions that Birdman's Keaton asks is whether to continue satisfying the crowds with more Birdmans, because actions and explosions are what they really like, or whether the serious pursuit of serious theatre is the way to go. You can argue I don’t get it and you may be right, but having watched Birdman I would be inclined towards the former. Why? 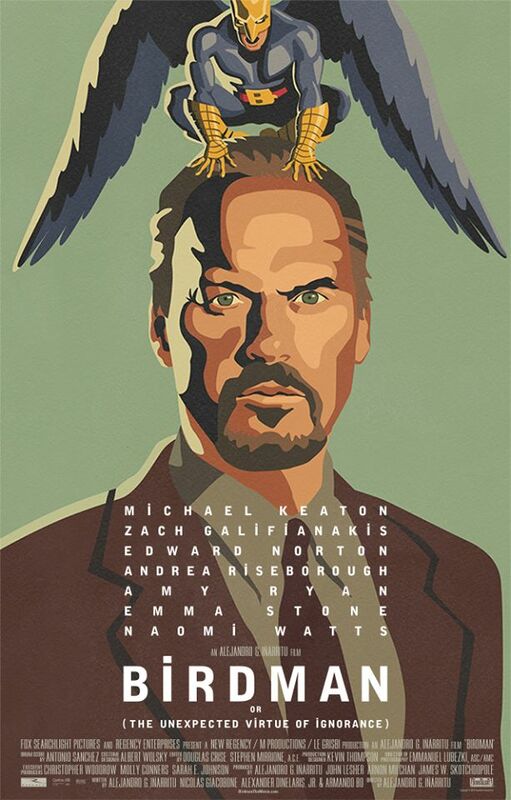 Because Birdman is a rather tedious affair, busier with style than substance, a movie that ponders a lot over the what Twitter would refer to as #FirstWorldProblems at best. In other words, at about two hours long, I have found Birdman to be tedious. And boring. Best scene: Keaton finds himself locked out of his theater’s back entrance in the middle of a show. He has to cross a very busy Times Square to get back in through the front door for his play’s climax. Only problem is, he’s wearing nothing but Walter White underwear. Overall: Artistic, yes, original, yes. I will still give Birdman only 3 out of 5 generally bored crabs.